As y'all may know, Mum and Dad have been out in Aberdeenshire with us for this week. It's been so good having them here, and so good for them, too, to see where we are living, to realise it really isn't so far away after all, and to simply chill out with us for a few days. My Mum 'having had enough' of shopping is practically unheard of. She is a kind of shop-or-browse-until-you-drop kinda gal. I am not. I simply don't get the pleasure in going around shops, whether to browse or to buy. If I need something, I would love to have someone find it for me and it arrive on my doorstep without my ever needing to walk through shop door. And as for browsing .... gimme strength, folks, do people actually do that for fun?? Anyway, back to Inverurie. 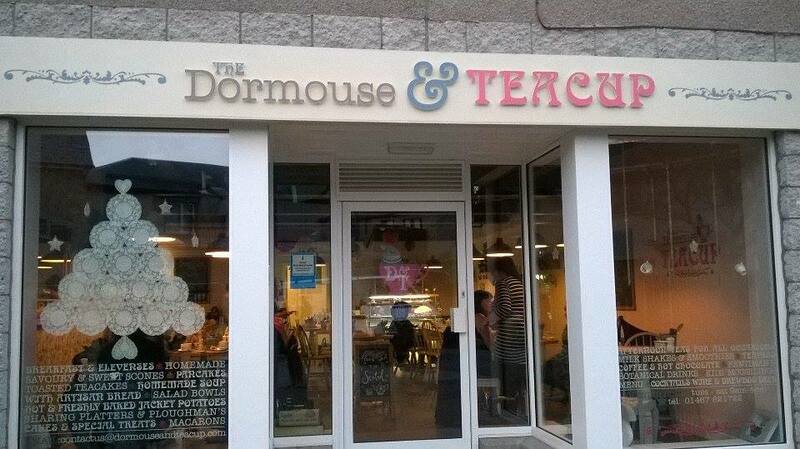 A girl at Katie's work had recommended a wee cafe, called The Dormouse & Teacup. Four days ago, on our first trip into Inverurie, we asked for directions to this establishment, and within seconds of stepping in the door, we were smitten! 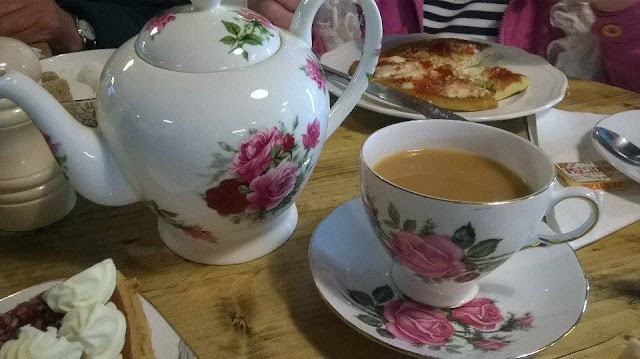 Our tea was served from this pot and into this cup and saucer. How could we not be smitten?! 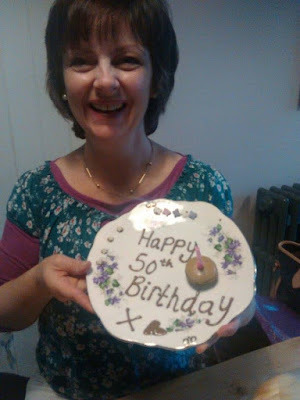 On that first day, Mum had a pancake (even the strawberry jam is home made), followed by a Raspberry and Coconut sponge. Along with my cuppa, I had Lemon, Lime and Coconut sponge. And my Dad had a Victoria Sponge. All were home made and were absolutely delicious. Dad's cappuccino and Calum Stewart's Latte were also spot on. 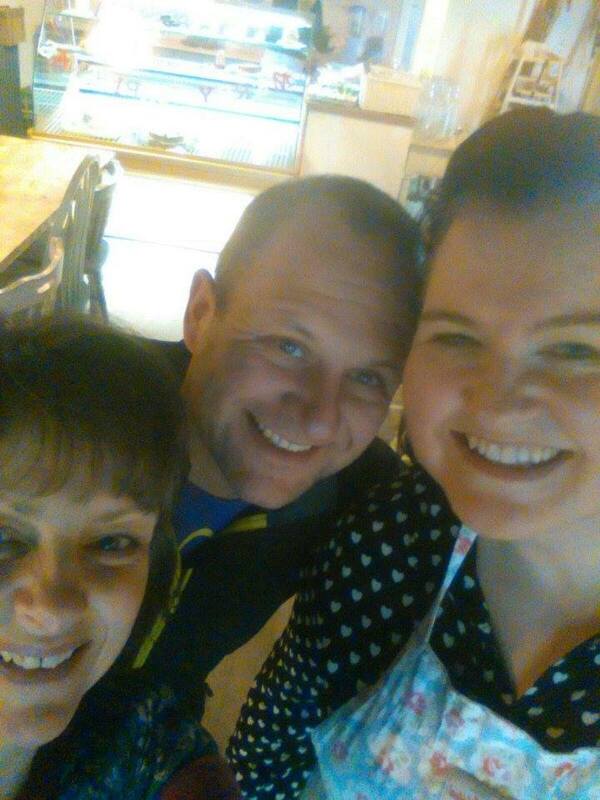 But even better than the yummy baking was the fabulous staff. They were so lovely and made what would have been a pleasant enough afternoon cuppa into something much more. The following day, when we visited again for our afternoon cuppa-and-cake, we met not only Lucy, who runs the cutely named establishment, but also her husband. 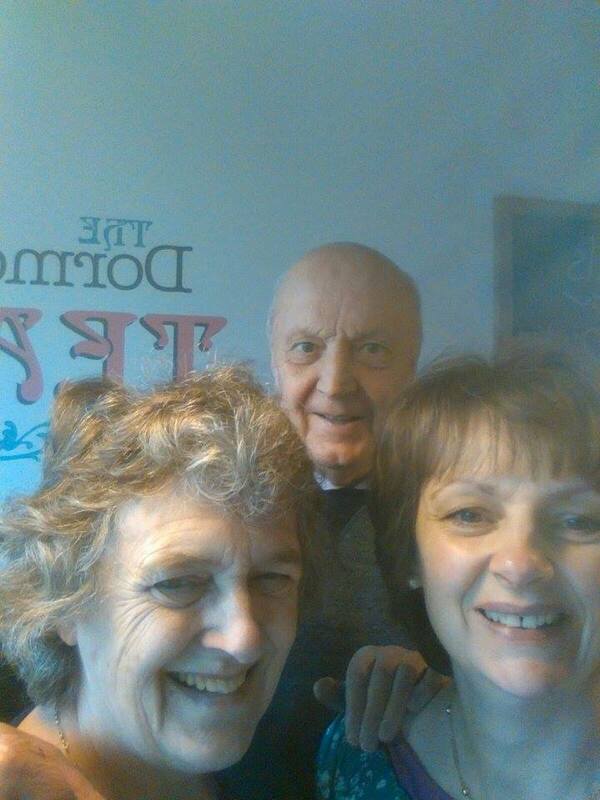 Seeing I had Calum Stewart's mobile in my hand, and I'd already spent at least three minutes getting a selfie of myself, Mum, and Dad, I asked Lucy and her husband to join me for another selfie. Here's Lucy and her hubby. If you're ever in Inverurie, drop in. The Dormouse & Teacup opened about a year ago, after they'd come up with the idea whilst on a date night, and spent almost a year planning and preparing for the actual opening. I do love hearing of business enterprises that have been thought up, been planned, and are now being successfully run by folks who love what they do. Below is the first selfie I took. This, just to prove to y'all that I did it. Successfully. We had such a laugh that day. It was my birthday and somehow that was mentioned in one of our blethers with Lucy and the waitress. It was said that I was in my 50th year, and so the dear ladies there secretly piped melted chocolate on a place and stuck a candle in a gorgeous salted caramel macaroon! I'm aware that a picture speaks a thousand words, so I want to tell y'all very loudly that I was forty-nine this week, not fifty. And yet, I'm pretty sure that if I'm around for my 50th next year, some of you will be saying, "I'm sure I remember her being 50 last year". Aye, you will.... you just wait and see. Well, poor Lucy was so embarrassed that she'd got my age wrong, but I assured her that her guess work was pretty good and that I wasn't in the slightest offended that she reckoned I looked fifty. And to prove it, I even came back with Mum and Dad the following day! This time we came for lunch, and even though I don't have photos of the food (I know - unforgivable, considering I blog), I have to tell you that Dad's Warm Smoked Salmon Salad was out of this world. Its presentation, which we all saw, and its taste, for which only Dad can vouch (yeah, I know, he didn't even offer me a taste. Disgraceful.) were equally delightful. My Sweet Potato and Roasted Pepper Soup was everything a soup ought to be. And so, will we be returning for more lunches, more teas and cakes, and undoubtedly more chat and laughter. Having had a taste of Aberdeen, I am delighted to hear Mum sing the praises of Inverurie as 'where I want to shop from now on'. When it comes to shopping, small towns are so much more enjoyable than cities. I like the pace at which they go. I like the smaller shops, in which staff often have a vested interest in the success of the business. I do love finding - and will have to spend some proper time looking for - a local greengrocer, baker, and butcher ... even though I do have to admit to having had my folks bring out white pudding and beef sausages from my favourite Stornoway butcher. I do love 'Willie MacLeod's sausages', and in all our years in Glasgow before moving back home, I never bought a sausage in the city. Every time we came home, or when anyone was coming to visit us in Glasgow, our freezer would end up loaded with these Stornoway sausages. It would seem that tradition is going to carry on now that we've moved away from home again. Still, Inverurie has an interesting array of shops, and as far as shopping can be enjoyable, this is my kind of browsing. Aren't we so blessed to have such opportunities for fun, laughter, and enjoyment in our lives. What gifts these things are from God. When we hear of such devastation and such evil taking place in other nations and cities, we can only praise God in the words of the Psalmist: "Unto me the lines have fallen in very pleasant places." Certainly, I can say these words, and I'm sure so many of you can too. As we approach this season of Thanksgiving, I do wish I could truly say that I was as thankful over this past year as I ought to have been. So many big things for which to give thanks. And so many 'little' things too. That shop sounds delightful! I'd be popping in everyday too, if I was there! Glad you've had such a wonderful birthday celebration, and time with your Mom and Dad. We do have much to be thankful for, and lots to pray about in our poor world. Indeed, Deanna. I think with all that's been going on over the past week, and weeks, that these pleasures bring home to us even more that our lines have fallen to us in pleasant places. And that is ALL from our Lord, from whom all blessings flow. This sounds heavenly...I want to come to Scotland so badly!!! The problem with Inverurie is that there are so many lovely places to eat out -it's hard to choose which to go to or recommend for anyone visiting: Dormouse and Teacup is probably my current favourite for tea and cake (afternoon tea is amazing but you must book in advance as it's all prepared personally). We always go to the Scone and Yon when the inlaws are visiting. For a casual social lunch I like the Garden Centre or Acorn Centre both of which have plenty of room for larger gatherings. Ashvale is my favourite for family dinners out. Fennel, Sabai or the Strathburn for a "posher" meal out. My husband always chooses Spice Cottage. I'm sure I missed some out but I've never had a bad meal in Inverurie. What a great list of places, Jenny! Thanks so much for that, and I'll be using it in exactly a week's time when Mum and Dad come for another visit with us.